TAKE AN EXTRA 5% OFF. USE COUPON CODE "dena5" AT CHECKOUT! Adequate liver function is essential for the healthy, happy life of your pet. Make sure your pet’s liver is functioning at optimal capacity with a range of our Denamarin® for dogs products. Treat your pet right with Denamarin® Tabs for Dogs and Cats, a highly regarded nutritional supplement for cats and dogs that aids liver function. Denamarin® cat and dog vitamins are a supplement used to promote your pets health. Liver-related problems can be a challenge to pinpoint, especially when it is being caused by an underlying issue. That’s why supporting the health of the liver is critical in cats and dogs. Veterinarians trust Denamarin® supplements more than any other brand when it comes to the health of their cats’ and dogs’ livers. Denamarin® works as a cat and dog vitamin to supplement the natural functions of your animal’s liver, making it perform the way nature intended it to. Best of all, the chewable form that this product comes in makes it easy to serve to your pets. Don’t let them grumble over their medicine – give it to them in the form of an easy-to-consume tablet. 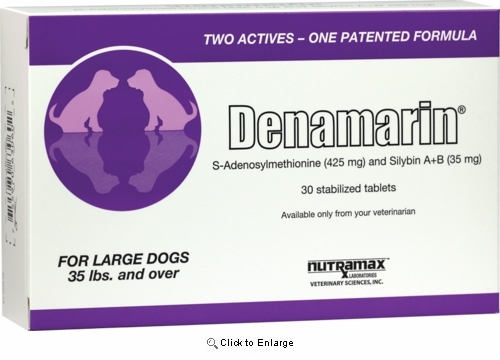 The ingredients inside Denamarin® allow it to deliver unmatched benefits to both cats and dogs. Denamarin® dog vitamins work by creating a significant uptick in levels of glutathione, a powerful antioxidant that is essential for the liver’s functioning. The two main ingredients, s-adenosylmethionine (SAMe) and silybin, are also recognized for potentially preventing cell death in the liver and aiding cell regeneration. Your pet’s liver is then free to protect its body against free radicals and other toxins. Combined, all of this supports healthy digestion and nutrient-absorption. 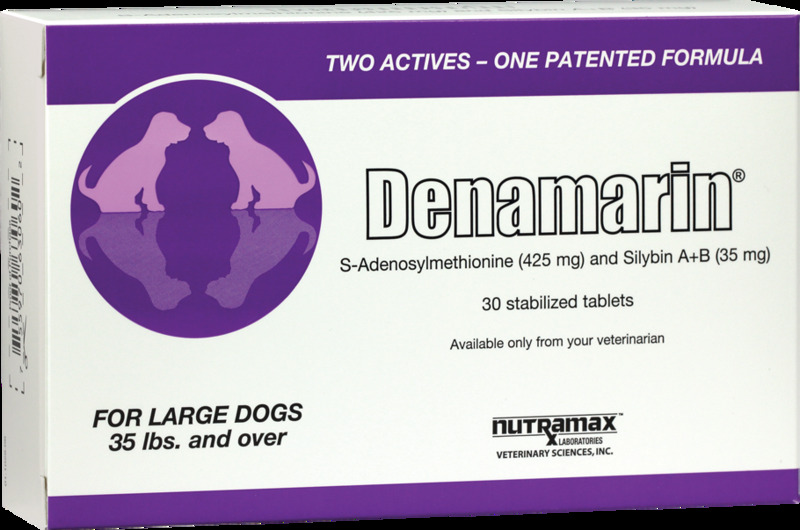 We offer Denamarin® online, available in tablets for small-, medium- and large-sized dogs and cats. You can rest assured that our competitive pricing guarantees the best price Denamarin® for large dogs and smaller pets, too. Please note: Be sure to administer the tabs on a pet's empty stomach one hour prior to eating. How much Denamarin® will I receive? Each Box contains 30 tabs.